The making of folding pocket knives. See the separate entry for general knife making. Folding pocket knives are believed to date back to the Iron Age. The Sheffield cutlery industry is believed to date back to the thirteenth century, although it was not until the mid- to late-seventeenth century that pocket knife making began in Sheffield. 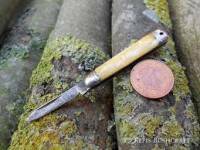 At this time pocket knives were known as ‘spring knives’, as they had a spring along the back to hold them open and closed. Sheffield cutlers developed methods to manufacture pocket knives in reasonable volumes and at affordable prices and with this, they became more widely available. The designs developed over the years such that they were useful for almost every occasion and to perform tasks typical of the era – from fine delicate knives used for cutting fruit or for sharpening quills (pen knives), through to more robust knives used by coachmen and soldiers. Pocket knives had to be made strongly with a good blade in the best steel available – spearpoint and lambsfoot were the most common blade shapes. They would be made with a multitude of other folding tools for various uses, such as spikes for removing stones form horses hooves, scissors, small saws, corkscrews, leather punches and even railway carriage door keys. Handles were made with materials appropriate for the knife’s use, ranging from metals and wood to more exotic materials like stag horn, mother of pearl and tortoiseshell. With Britain’s industrial Revolution pocket knife production developed further, and firms like Joseph Rodgers and George Wostenholmbecame significant exporters of the era, opening up new markets in America, Africa, Australia and others. Military knives for soldiers and sailors were developed in the nineteenth century from the strong and workmanlike knives supplied to coachmen and tradesmen. The knives had strong sheepfoot blades with horn handles, but this was later replaced by plastic materials with a non-slip diamond patterned surface. A tin opener was introduced at the end of the nineteenth century for troops supplied with food in tins – the accompanying tin openers were invariably lost. Hundreds of thousands of these were produced during the wars by companies like Joseph Rodgers, a forgotten part of Sheffield’s war effort, when only army knives could be produced with the available steel. A folding knife consists of a blade, spring, two linings, two bolsters, two ‘scales’ for the handles, and wire for riveting the knife together. The blade blanks and springs are cut from sheet steel. They are then marked, drilled, nicked and straightened before being hardened and tempered. The blades are then ground and cleaned, before the knife is assembled. The assembled knife is then ‘knocked up’ using a hammer and an anvil. The knives are then ground and shaped to the required finish, before being given a final polish and sharpen. A detailed description with images can be found here. Recruitment issues: Difficulty in finding people who want to work in manufacturing as people don’t want to get their hands dirty. A. Wright & Son – based in Sheffield. Eggington Brothers – based in Sheffield. Sell folding knives under several brands. Taylors Eye Witness – based in Sheffield. Making on a much smaller scale than they used to. Total number of craftspeople: A. Wright & Son of Sheffield manufactures knives, folding knives and swords and does hand grinding in-house. They have a workforce of ten people – five older people, and five younger people whom they train from scratch, and everyone does a bit of everything.